Caryll Houselander is best known for the intensity of her vision of the suffering Christ and His immeasurable love for us, a theme that she frequently spoke of with breathtaking luminosity in her many books about Him. 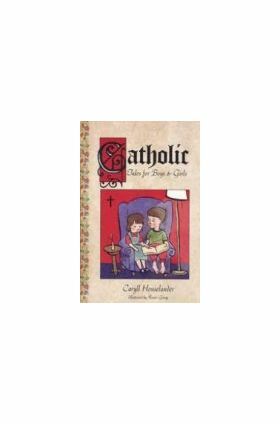 Few know, however, of the many remarkable stories she wrote for Catholic children – delightful tales that are simple but not shallow. Indeed, like her books for adults, they manifest a tender love of Christ and His little ones not commonly found among us these days. Here are twelve of Houselander’s best tales, charmingly illustrated with Renee George’s lively drawing of pirates and princess, castle’s and kings. Through the tale of Jack and Jim, even young children will grasp the meaning of Christ’s suffering; in Racla the Gypsy, they’ll discover the charity which is at the heart of the Eucharist; in the Cure’s Guest, they’ll see how Christ makes up for the sins of others. Other stories touch on other Catholic themes, but these tales are not really catechetical. Yes, they do take for granted that Catholicism plays a large role in the lives of these children, especially prayer and the Mass. But they do something more… and more important. 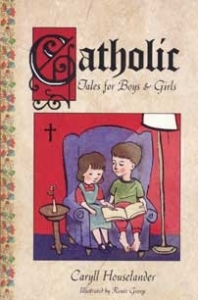 Tale after tale introduces children to the tender love that Jesus has for each of them, and to the fire of love for Him that can burn in the heart of Catholics – even in the hearts of little ones like themselves. I got this one for my 8 year old son, and I ended up enjoying it myself! Loved the moral lessons embedded in the wholesome, positive stories, which were easy enough for my son to grasp. He couldn't wait for more, so bought the sequel too! Last Christmas, I gave copies to all my nieces and nephews between 7 and 11, and their parents (all Catholic) appreciated the gifts very much, as did the children.